Planit Canada Inc. has announced the immediate availability of Cabinet Maker by Cabinet Vision, an entry-level rental software that helps cabinet shops get started on the road to automation; providing customer presentations, quotes and manufacturing information. Cabinet Maker enables cabinet shops purchasing CNC machines to rent an affordable design and manufacture software by Cabinet Vision directly through machinery vendors. 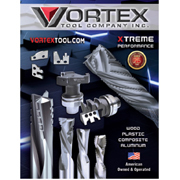 Vortex Tool Company's new 112-page product catalog, Catalog #9, is now available. 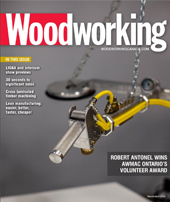 The catalog includes thousands of tools divided into wood tooling, plastic tooling, insert tooling and machine tool accessories sections to make it easy to find the tool you need. The catalog introduces new tool series and contains valuable technical information that can be used to calculate feeds and speeds for programming CNC machines. 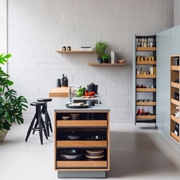 Richelieu complements its selection of kitchen accessories by introducing Fioro - stylish pullout shelves that combine high quality metal shelves with wood front panels and side rails. This innovative solution helps create design harmony in interior decor. Keeping up with industry trends, Fioro offers both an aesthetic and functional solution allowing anyone to have outstanding design on the inside of their cabinets too. No matter whether in hard copy or online, Blum's product catalogue is always a popular reference book for cabinet makers. The new. 700-page catalogue is packed with useful information and the latest innovations. Find product innovations offering new possibilities in furniture design: new hinges, BLUMOTION S runners, CLIP top and BLUMOTION in onyx black. Blum has also picked up on a design trend: thin fronts for lift systems, doors and pull-outs. CNC Automation offers the Fravol Master series of compactand fully featured edgebanders. A single automatic edging machine for application of PVC, ABS, melamine, veneer and solid wood edges in strips or rolls. Measuring less than 3.5 meters in length, the Fravol Master series edgebander is one of the most compact edgebanders on the market with both pre-milling and an all-in-one end trimming and corner-rounding unit. KUPER introduced a new veneer saw to the American market at IWF Atlanta. The new saw is for accurately cutting veneer bundles of any veneer thickness. The optional routing head produces an even smoother edge for a fine splice line. Other thin material like HPL or thin-MDF can also be cut with this machine. The new saw is a perfect addition to the KUPER FL Innovation longitudinal veneer splicer." Combilift, the material handling solutions provider, has launched the first purpose-built order picker. The Combi-OP is the first purpose-built order picker on the worldwide market for long products. Previously customers have had to modify traditional order pickers to cope with the specific demands of long loads. The Combi-OP now guarantees much more efficient and non-compromised operation for easy picking of long profiles in, for example, steel service centres. Planit Canada has made new GRASS hardware packages available for download.Among the new packages are GRASS NovaPro Drawer System available for Cabinet Vision version 10 & 11 and GRASS Kinvaro Liftert, also available for Cabinet Vision version 10 & 11. Head over to Planit Canada to see them all. The PalletPal Rotator Inverter from Southworth Products Corp. is the fast, safe, and easy way to invert a fully loaded pallet without the need for labor intensive, time-consuming manual restacking. The most common use of the PalletPal Rotator Inverter is for switching loads from in-house pallets to shipping pallets or slip sheets. Other uses include replacing broken pallets, replacing damaged boxes or bags (at the bottom of the load), or turning inventory for mixing. Festool will launch the new CT CYCLONE, an anti-static, pre-separator for large debris and coarse dust that is designed to be used with a Festool CT Dust Extractor on Oct. 1. By separating large particulate before it reaches the dust collector, users can increase the efficiency and cost effectiveness of their portable Festool dust collection systems by reducing the number of filter bags needed. The CT CYCLONE also reduces the overall dust load on the main dust extractor filter. Akhurst Machinery offers the ITALPRESSE XL hot press which is available in standard sizes with widths from 1300mm to 2200 mm and in lengths from 1300 mm to 5200 mm. Features digital control for easily adjusting pressure, pressing time, and temperature. Available in fabricated steel & drilled solid steel platens. Re-circulating thermo oil heating system for consistent pressing temperatures. RAMPA showed its patented threaded insert type SKD330 at the IWF in Atlanta in August. The innovative three external thread design prevents the insert from tilting when screwed in thereby allowing for perfectly straight installation every time. In addition, the new patented thread provides up to 2.5 times faster processing in all wood and wood related materials. Self-cutting inserts or threaded inserts are an integral part of construction elements in the wood, plastic and metal. The only thing that can make increased battery power more attractive is putting all that additional performance in a smaller package. With the help of greater power efficiency found in 21700 Lithium-ion cell technology, Bosch has developed the GBA18V40 CORE18V 4.0 Ah battery to bring all of the capability of the original CORE battery into a smaller, lighter package. The new cell introduces much more active battery volume in a pack that's only slightly larger than the previous 20700 cell packs. Planit Canada Inc. is excited to offer a better way to get accurate room measurement data that will save clients time and money. Cabinet Vision has worked directly with the developers of the DISTO system to create a seamless and direct link between the two products. Cabinet Vision Version 11 is now able to directly link with the Leica DISTO S910 to provide a seamless job measuring solution. Consistent with the aesthetics of the first generation of Silentia, with identical dimensions and shape, Silentia+ incorporates new technological innovations that place this hinge at the forefront of decelerated closing systems. The decelerating effect is achieved via twin silicone-oil dampers, housed in the hinge cup, which guarantee exceptional consistency of deceleration in all operating conditions and optimum closing action with all kinds of door and in all applications. Dark-coloured furniture embodies a sleek elegance – inside and out. Blum's CLIP top BLUMOTION in onyx black fits discreetly into furniture, creating a distinctive style for greater creativity in high-quality furniture, without compromising on design. 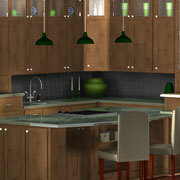 Additions to the program include wider angles and specialty hinges allowing for even more freedom of design. All hinges are equipped with Blum's innovative BLUMOTION technology therefore soft close is seamlessly integrated into the hinge boss. With the development of the Tiomos hinge system, GRASS has written a new chapter in the history of furniture design. With the concealed Tiomos Hidden hinge, which was launched at interzum 2017, GRASS has added another component that makes it possible to move doors elegantly and almost invisibly. The concealed Tiomos Hidden hinge is recessed in the cabinet and is flush with the surfaces of the door and of the inside wall of the piece of furniture. LIGNA 2017 saw the world premiere for HOMAG Group's groundbreaking new digital platform tapio. Described as the new digital platform for the wood manufacturing industry, tapio combines digital products for the entire wood industry with thousands of production machines as well as a wide range of materials and tools in an IoT platform (IoT = Internet of Things). In short: This digital platform completely covers the whole wood industry value chain. Felder's new Creator 950 offers traditional CNC processing in a small space. With attractive standard equipment, modern CNC technology and individual additional options, the creator 950 offers efficient CNC processing at a fair price. No lost time in changing tools — the big advantage when compared to other CNC machines: No vacuum pods and console positioning, no field selection, just start working. The fast and intuitive programming is one of the key technologies with Format-4. This small machining centre for vertical drilling is able to produce up to 400 pieces per shift, is ideal for batch size 1 production and drilling on five faces of the panel with routing and grooving operations. Reliability and flexibility with the reduced maintenance of the drilling unit and with shortest machining cycles and zero downtime for setup operations. TigerTouch is a powerful new touch screen software that runs TigerStop products on the Microsoft Surface Pro. Easily handles fully automated material processing on touch screen. Allows for push feed optimization and crayon defect marking. Easily imports, views, and edits cut lists. Pollmeier has developed a new technology, which allows them to economically produce top-quality laminated veneer lumber from beech for structural applications. It's called BauBuche, and uses only raw material from local and sustainably managed forests in its production. In one of the most modern production facilities in Europe, the tree is rotary peeled and transformed into a high-tech material with hardly any waste. From now until Dec. 31, 2017 KCD Software is offering custom cabinetmakers and closet designers a 31-day trial of its fully-functional Cabinet Designer/Closet Designer software at no cost. Designer is the robust first level of KCD Software's complete manufacturing solution. "Our goal is for cabinet makers and closet designers to have a different kind of software experience - one that supports them in their success," says Brian O'Keefe, sales associate for KCD Software. IGIOTTO by Falcioni is a turnkey solution for spraying large, multi-dimensional, vertical surfaces with exceptional precision. Featuring a two-gun application head, it's excellent for all substrates, wood, plastics, and other materials. iGIOTTO features exceptional programming ease and flexibility, low coatings use due to exceptional accuracy, consistent application and superior results and it provides state-of-the-art automatic spray coating for panels and 3D objects. The VEN SPRAY VARIO from Venjakob combines the flexibility of an industrial painting robot with the high output of a reciprocating spraying machine. Precise coating of edges by robot and coating of surfaces by reciprocator with constant speed 'inline.' No stop and go, just constant work flow. Therefore more output (coated surface/minute) in comparison to other machines, available on the market. Festool's new HK and HKC saws easily make accurate and repeatable crosscuts with minimal equipment and minimal time. Make exact and repeated cuts quickly and accurately anywhere without taking materials to a miter saw or sacrificing accuracy with a standard circular saw. Perfect for the jobsite and all ripping tasks. Equipped for plunge cutting for cutouts with easy depth control and release. IMA offers production control with a push of a button. 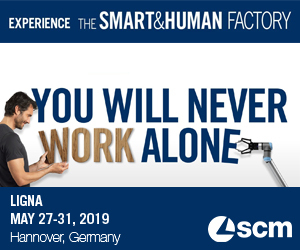 The complete process of from the initial cut to size process all the way to the automated sorting and stacking of the panels is controlled via the IMA supervisory control system specifically developed for automated processing systems. This supervisory control system includes a software tool with visualization and production control capabilities and all machines in the processing system are connected for transparent data exchange. Thanks to Biesse's 4.0 ready solutions these companies can become full-fledged "smart factories." Among the broad product offering were three vertical machining centres for boring, the Brema Eko 2.1, Brema Eko 2.2 and Brema Vektor 15. Brema boring machines can carry out all boring, milling and glue and dowel insertion operations, as well as boasting the ability to manage additional hardware inserts. Salice has introduced the Wind lift system. Wind is characterized by compactness and elegant design. Its movement is smooth and perfectly controlled. Wind is small and unobtrusive, enabling the maximum utilization of cabinet internal space. In the kitchen environment, Wind has strong functional appeal — a compact adjustable lift system that takes up a minimum of valuable storage space. Biesse's Stream A is an industrial edgebander designed to create a new standard in automatic edgebanding. An innovative, modern, ergonomic design is combined with productivity, efficiency and flexibility for the application of all types of edge-banding material. The Stream A is equipped with the award winning AirForce System. Accuride, a leader in movement solutions, has just introduced the high performance 3135EC, Eclipse Undermount Slide. The Eclipse undermount easy-close slide is a fully concealed, high performance, commercial grade undermount slide featuring reduced noise, minimal side-to-side movement and drawer sagging, consistent soft close action and a 3-way drawer front adjustment feature. Fully concealed, the redesigned slides offer improved full extension movement with a 100-pound load rating. Akhurst offers the new Altendorf F45, a masterpiece of technology and design. The comprehensively redesigned machine frame combines absolutely unprecedented torsion resistance with extremely low levels of vibration. The famously smoothrunning sliding table remains the undisputed benchmark for precision cutting with minimal maintenance. The Free family fittings from Häfele Canada vary the flap opening geometry allowing for creative design, maximizing available space, and simple installation. Engineering expertise provides freedom of movement and unparalleled elegance. Hafele introduces the XC-300 cart with a 300 kg load capacity. The comfortable, soft touch ergonomic handle is foldable, making it easy to store. Features smooth running, low noise wheels with castors encased in a durable galvanized casing with mounting plate. HOMAG Canada introduces the Kentwood CS150EL through feed cross cut saw. Feed speeds up to 80m/min, 80 cutting cycles per minute and cutting accuracy +/- 1mm. This entry level saw comes with standard touch screen interface control and is ideal for the small to medium shop with low to moderate cross cut requirements. Accuride's invisible Senseon Secure Access system reduces theft risk while maximizing productivity, revenue, and customer experience. Accuride International is excited to unveil Senseon Secure Access, a new brand of commercial-grade access control systems for cabinets, furniture, and fixtures. Simply tapping an RFID card over a proximity reader unlocks the cabinet, enabling quick and easy access without compromising security. Taurus Craco Machinery introduces WOOD-ED table, a unique virtual training table that simulates four different types of machines (band saws, dimensioning saws, planer and router). This advanced equipment provides the student with a fully immersive experience of his or her activity. It tracks the user's hand motion and provides them with a realistic 3D vision of the tool and wood materials. Furthermore, a unique force feedback system recreates the real feeling of wood cutting.